The reverse osmosis (RO) membrane is in use today as a main component of water filtering equipment, because it has a fairly high performance record in removing various impurities such as salt from water. Especially in isolated islands and desert regions where there is no other choice but to utilize seawater as the only water resource, the RO membrane is an indispensable component of the RO module for water purification systems. To maintain high-performance filtration, however, the RO membrane which comprises a polymer composite membrane needs to be cleaned at optimal time intervals. For this, a diagnostic function that calculates the performance indicators of the RO membrane by using the data of key parameters including temperature, flow rate, and conductivity, and assesses trends in performance degradation, is needed. 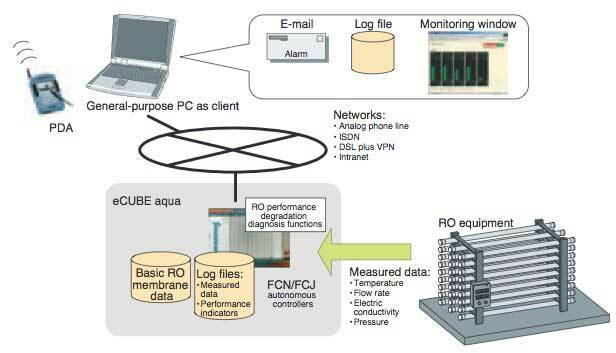 This paper describes "eCUBE aqua", a one-box solution for RO membrane systems with functions such as RO membrane diagnosis, long-term data storage and remote monitoring, which is designed to be incorporated into STARDOM autonomous controllers. Today, with a increasing demand for safer potable water behind, the RO membrane is expanding in application to water purifiers for household use. Figure 1 shows an example of the set- up of a desalination plant. As discussed above, while the RO membrane has a high level of filtration performance, maintenance based on correct membrane cleaning is essential in order to maintain its capability. "eCUBE aqua" Application Portfolio for Reverse Osmosis Membrane Diagnosis 19 If cleaning is done at the wrong time, the RO membrane, which is a composite polymer membrane, may fail to fully recover its intrinsic performance even if cleaned, thus potentially wasting the valuable service life of the membrane. Under normal conditions, the cleaning time of RO membranes is determined by the operator's experience or the schedule of the facility, or cleaning is conducted at regular fixed times. In order to automate these cleaning procedures and select the optimum time and method for cleaning, knowledge of RO membranes and diagnostic software is required. Conventionally, the diagnosis of deterioration in RO membranes has been implemented as off-line applications. Recently, we have developed an RO membrane deterioration diagnosis package: "eCUBE aqua", which runs online on Yokogawa's STARTDOM FCN/FCJ autonomous controllers that are installed on-site. eCUBE aqua is a remote monitoring application package for maintenance use and is free of engineering costs. It provides the user with such easy-to- understand data as the recommended next date of cleaning obtained by predictive calculations of RO membrane performance indicators. The RO membrane was initially developed for the purpose of transforming seawater into freshwater. A feature of the membrane is lower energy consumption, compared with other separation methods, because it can separate salt from seawater without having to evaporate water. Generally speaking, water treatment systems are composed of a combination of technologies such as microfiltration, ultrafiltration, RO membranes, ion-exchange membranes, and ultraviolet sterilizers according to the target level of water quality. The RO membrane is costly among other things, and is a consumable that gathers impurities, causing filtration performance to deteriorate with time. Thus, the membrane is a component that, without the appropriate maintenance, entails high running costs. RO equipment is a filter using a semipermeable membrane that allows only water to pass through. In cases where liquids exist on both sides of the semipermeable membrane, only water molecules migrate from the side with a lower concentration to the side with a higher concentration. Thus the membrane has the effect of attempting to equalize the pressures (concentrations) of both sides (Figure 2-(1)). This effect is referred to as "osmosis" and the differential pressure when osmosis reaches equilibrium is referred to as the "osmotic pressure" (Figure 2-(2)). On the other hand, if a pressure higher than the osmotic pressure is applied to the side with a higher concentration, water molecules move from the side with a lower concentration to the side with a higher concentration (Figure 2-(3)). This phenomenon is referred to as "reverse osmosis". Figure 3 shows the basic configuration of an RO membrane system. Polymers are removed from raw water during pretreatment using sand filters and ultrafiltration membranes. After pretreatment, feed water to be supplied to the RO membrane is pressurized by a high-pressure pump and introduced into the RO module. Only the water molecules of the feed water thus pressurized pass through the RO membrane and are drawn out as permeate water. Impurities and water that did not pass through the RO membrane are drawn out as concentrate water. If pure water is the aim of this system, the permeate water is the product, whereas in sugar plants and concentrated juice plants, the concentrate water is the product. An RO membrane, if used continuously, gathers impurities on its surface on the feed water side and therefore clogged, leading to degradation in its capabilities. To remove such impurities, the RO membrane must be cleaned. The high-pressure pump is turned off and the surfaces of the membrane are cleaned for several hours using a cleaning chemical selected according to the quality of the feed water and the nature of the impurities. The performance of the RO membrane is recovered by means of cleaning, but does not revert completely to its initial level. Accordingly, the membrane gradually deteriorates in performance and finally reaches the end of its service life (Figure 4). If cleaning is performed too late and the RO membrane is too dirty, the rate of recovery lowers and thus its service life shortens accordingly (Figure 5). It is reported that under normal conditions, it is desirable to clean the RO membrane when the permeate flow rate decreases by 10%, and the rate of recovery lowers if the permeate flow rate decreases by 20%. In order to use the RO membrane up to the end of its intrinsic service life, it is necessary to constantly monitor the condition of the RO membrane and clean it at appropriate points in time. In addition, users can compress and store 10 years' worth of daily report data in the compact flash memory of an autonomous controller. Thus, this system also functions as a data recording system that fully supports the service life of RO membranes even for RO equipment not connected to a network. eCUBE aqua creates RO membrane performance indicators, predicts the trend of degradation by examining chronological changes in the indicators, and foretells the optimum time for the next round of cleaning. eCUBE aqua calculates the performance indicators listed in Table 1 from membranes' reference performance data provided by RO membrane vendors and, from measured data acquired from RO equipment. The permeate flow rate is one of the indicators used to evaluate the performance of RO membranes. However, this indicator largely depends on constantly fluctuating ambient conditions, such as water temperature. For this reason, eCUBE aqua determines the performance indicators by applying normalized calculations so that external conditions, including temperature and pressure, are the same for each calculation. The trend of this performance indicator reveals the trend of degradation. The normalized calculation formulas of eCUBE aqua are based on the formulas for evaluating the normalized permeate flow rate and the salt passage of RO membranes as defined by Standard D4516 of the American Society for Testing and Materials (ASTM). Transmembrane differential pressure Measured data is used to calculate this item. Normalized permeate flow rate A data item normalized with respect to the temperature, pressure, electric conductivity, and reference data. Salt passage The salinity of permeate water calculated from electric conductivity. Rejection The amount of salinity reduced from feed water. Recovery The ratio of permeate water recovered from feed water. In regard to the three indicators: transmembrane differential pressure, normalized permeate flow rate, and salt passage, which are among the list of five performance indicators in Table 1, the following future values are predicted on the basis of changes in the trends of their respective data. In order to increase the accuracy of prediction, non-steady- state data is deleted using the standard deviation method. A pseudo straight line is obtained from the relationship between the time axis and performance indicator using the least-square method. Using this pseudo straight line, the number of days taken to reach a preset value set for each performance indicator is calculated. eCUBE aqua outputs the number of days nearest to the present day, among the numbers thus calculated, as the time for RO membrane cleaning. The performance degradation rate of RO membranes is not linear from the long-term perspective, and is greatly affected by the season and/or the quality of feed water. If a large environmental change has taken place, correct results may sometimes be provided by the predictive value calculated on the basis of the latest, short-term chronological data, rather than by that calculated on the basis of long-term chronological data. 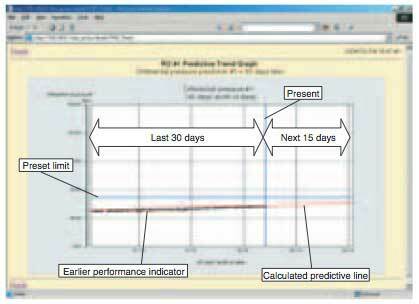 eCUBE aqua calculates two predictive values for cases where 30 days' and 7 days' worth of sample data are used. eCUBE aquaompares these two predictive values and adopts the data with a shorter lead time as the actual predictive value. The results of prediction can be visualized as a trend graph. Figure 7 shows an example of degradation trends predicted from 30 days' worth of sample data on the transmembrane differential pressure. Recently, networks have become more extensively decentralized and controllers have become increasingly advanced. It has therefore become possible to distribute functions, into controllers, host computers, and other equipment, irrespective of the physical classification of hardware. eCUBE aqua is a one-box solution that integrates control functions, logger functions, HMI functions and diagnostic functions into the STARDOM FCN/FCJ autonomous controllers employed as the base for these functions. We hope that the RO membrane degradation diagnosis functions of eCUBE aqua will contribute to reductions in maintenance costs, running costs, and overall costs as well.